Ask Ethan: What Was The Entropy Of The Universe At The Big Bang? Was it really a low-entropy state? And what does that mean for the second law of thermodynamics? The common understanding of entropy and time implies a very low-entropy state just after the Big Bang. Yet, that moment is often described as a “soup” of photons, quarks and electrons, something that, by comparison with everyday textbook examples, seems very high entropy…. How is that primal state low-entropy? The thermodynamic arrow of time implies that entropy always goes up, so it better be larger today than it was in the past. The early Universe was full of matter and radiation, and was so hot and dense that the quarks and gluons present didn’t form into individual protons and neutrons, but remained in a quark-gluon plasma. Image credit: RHIC collaboration, Brookhaven. 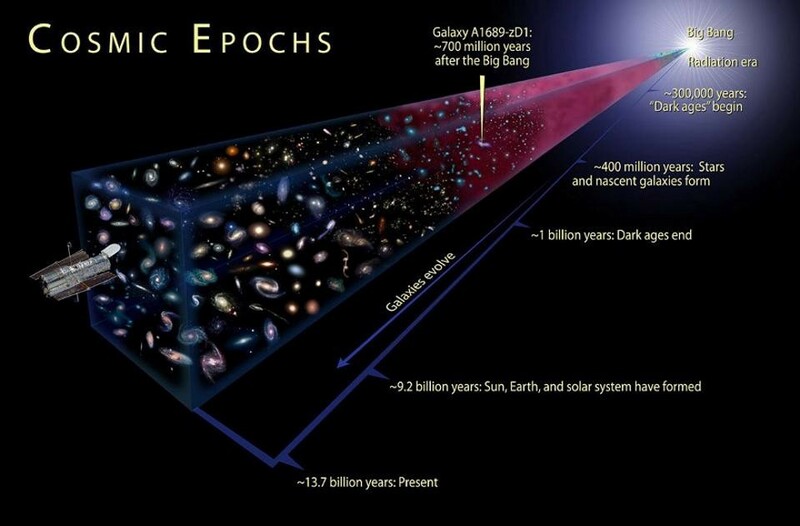 And yet, if we think about the very early Universe, it sure looks like a high-entropy state! Imagine it: a sea of particles, including matter, antimatter, gluons, neutrinos and photons, all whizzing around at energies billions of times higher than even the LHC can obtain today. There were so many of them — perhaps 10⁹⁰ in total — all crammed into a volume as small as a soccer ball. Right at the instant of the hot Big Bang, this tiny region with these tremendously energetic particles would grow into our entire observable Universe over the next 13.8 billion years. Our Universe, from the hot Big Bang until the present day, underwent a huge amount of growth and evolution, and continues to do so. Image credit: NASA / CXC / M.Weiss. Quite clearly, the Universe today is much cooler, larger, more full-of-structure and non-uniform. But we can actually quantify the entropy of the Universe at both times, at the moment of the Big Bang and today, in terms of Boltzmann’s constant, kB. At the moment of the Big Bang, almost all of the entropy was due to radiation, and the total entropy of the Universe was S = 1088kB. On the other hand, if we calculate the entropy of the Universe today, it’s about a quadrillion times as large: S = 10103kB. While both of these numbers seem large, the former number is most definitely low-entropy compared to the latter: it’s only 0.0000000000001% as large! The Universe, as we see it today, is far clumpier, more clustered, and generating of starlight than the early Universe was. So why is the entropy so different? Image credit: ESA, NASA, K. Sharon (Tel Aviv University) and E. Ofek (Caltech). There’s an important thing to keep in mind when we talk about these numbers, though. When you hear terms like “a measure of disorder” bandied about, that’s actually a very, very poor description of what entropy actually is. Imagine, instead, that you’ve got whatever system you like: matter, radiation, whatever. Presumably, there will be some energy encoded in there, whether it’s kinetic, potential, field energy or any other type. What entropy actually measures is the number of possible arrangements of the state of your system. If your system has, say, a cold part and a hot part, you can arrange it in fewer ways than if the whole thing is the same temperature. The system, above, on the left, is a lower-entropy system than the one on the right. The photons in the cosmic microwave background have practically the same entropy today as they did when the Universe was first born. This is why people say the Universe expands adiabatically, which means with a constant entropy. While we might look at galaxies, stars, planets, etc., and marvel at how ordered or disordered they appear to be, their entropy is negligible. So what caused that tremendous entropy increase? Black holes are something the Universe wasn’t born with, but has grown to acquire over time. They now dominate the Universe’s entropy. Image credit: Ute Kraus, Physics education group Kraus, Universität Hildesheim; Axel Mellinger (background). The answer is black holes. If you think about all the particles that go into making a black hole, it’s a tremendous number. Once you fall into a black hole, you inevitably arrive at a singularity. And the number of states is directly proportional to the masses of the particles in the black hole, so the more black holes you form (or the more massive your black holes get), the more entropy you get in the Universe. The Milky Way’s supermassive black hole, alone, has an entropy that’s S = 1091 kB, about a factor of 1,000 more than the entire Universe at the Big Bang. Given the number of galaxies and the masses of black holes in general, the total entropy today has reached a value of S = 10103 kB. An X-ray / Infrared composite image of the black hole at the center of our galaxy: Sagittarius A*. It has a mass of about four million Suns… and an entropy about 1000 times that of the entire Big Bang. Image credit: X-ray: NASA/UMass/D.Wang et al., IR: NASA/STScI. And this is only going to get worse! In the far future, more and more black holes will form, and the large black holes that exist today will continue to grow for about the next 1020 years. If you were to turn the entire Universe into a black hole, we’d reach a maximal entropy of approximately S = 10123 kB, or a factor of 100 quintillion greater than the entropy today. When these black holes decay on even larger timescales — up to around 10100 years — that entropy will remain almost constant, as the blackbody (Hawking) radiation produced by the decaying black holes will have the same number of possible state arrangements as the formerly-existing black hole itself. Over long enough timescales, black holes shrink and evaporate thanks to Hawking radiation. That’s where information loss occurs, as the radiation no longer contains the information once encoded on the horizon. Illustration by NASA. So why was the early Universe so low-entropy? Because it didn’t have any black holes. An entropy of S = 1088 kB is still a tremendously large value, but it’s the entropy of the entire Universe, which is almost exclusively encoded in the leftover radiation (and, to a slightly lesser extent, neutrinos) from the Big Bang. Because the “stuff” we see when we look out at the Universe like stars, galaxies, etc., has a negligible entropy compared to that leftover background, it’s easy to fool ourselves into thinking that entropy changes significantly as structure forms, but that’s merely a coincidence, not the cause. At minimum, it took tens of millions of years for the Universe to form its very first star, and its very first black hole. Until that happened, the entropy of the Universe, to more than a 99% accuracy, remained unchanged. Image credit: NASA/CXC/CfA/R. Kraft et al. If there were no such things as black holes, the entropy of the Universe would have been almost constant for the past 13.8 billion years! That primal state actually had a considerable amount of entropy; it’s just that black holes have so much more, and are so easy to make from a cosmic perspective. Starts With A Bang is based at Forbes, republished on Medium thanks to our Patreon supporters. Order Ethan’s first book, Beyond The Galaxy, and pre-order his next, Treknology: The Science of Star Trek from Tricorders to Warp Drive!